Journal Reference: Burleyson C, S Hagos, Z Feng, B Kerns, and D Kim. 2018. "Large-Scale Environmental Characteristics of MJOs that Strengthen and Weaken Over the Maritime Continent." Journal of Climate, 31(14), 10.1175/JCLI-D-17-0576.1. 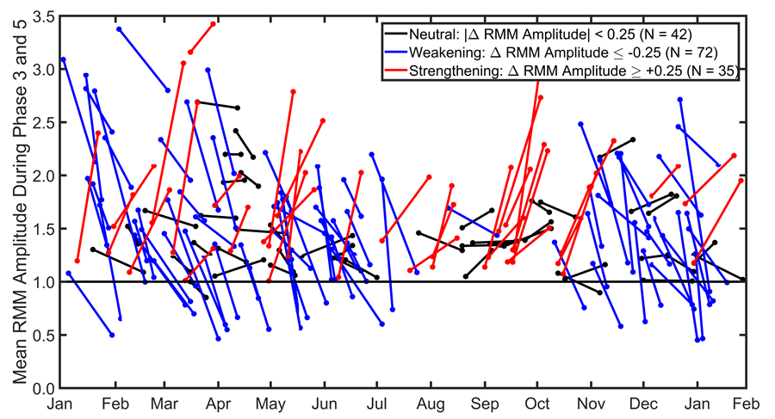 The annual distribution of MJO amplitude reveals a seasonal cycle: strengthening (red, ascending lines) occurs over the MC more often in northern hemisphere (NH) summer and fall, and weakening (blue, descending lines) occurs more during the NH winter. The graph is based on the time series of RMM index phase and amplitude from 1974 to 2013. As the Madden-Julian Oscillation (MJO) moves eastward along the equator, it weakens or strengthens as it crosses the islands of the Maritime Continent (MC). Scientists have been unsure why it behaves one way or the other. Investigating this “barrier effect,” a research team led by the U.S. Department of Energy analyzed layers of information, from the temperature of the sea surface to moisture, precipitation, and air divergence. They discovered that the MJO varies with the seasons, and is also influenced by El Niño/La Niña. The MJO is a primary driver of intraseasonal variations in tropical precipitation. A better understanding of the physical processes that dictate MJO-MC interactions is key to improving their representation in atmospheric models. Identifying the seasonal variation also reinforces the need for MJO measurements to be collected throughout the year. In weather and climate models, scientists historically have had difficulty simulating changes in the MJO as it crosses the MC. Analyzing cases of weakening and strengthening, researchers identified for the first time a seasonal cycle of MJO intensity changes over an area encompassed by Singapore, the Philippines, and Papua New Guinea. Their analysis showed that MJOs approaching the MC during the Northern Hemisphere winter tend to weaken, while MJOs that approach the MC during the Northern Hemisphere summer often intensify. When the MJO crosses the MC in the Southern Hemisphere, it encounters more and taller islands than in the Northern Hemisphere. Those islands can disrupt the MJO by limiting its moisture supply and upsetting its daily rhythm. The researchers also found that MJOs were twice as likely to weaken in El Niño years as compared to La Niña years.